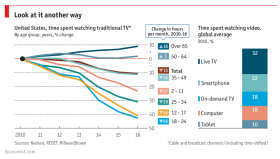 A special report in The Economist examines the extremely slow changes in television viewing habits and why, as I’ve been teaching for years, it takes media decades to really change. On-line marketers have predicted the death of direct mail, email, cold-calling, radio, television and everything else that was supposed to be completed replaced by the web. Yet, here we are with television approaching “Peak TV” when there will be more scripted shows on the air than demand in the market. This year Hulu, Netflix and Amazon will spend over $10 billion on original programming. We’ve been told you can’t keep the attention span of the average young consumer, yet binge watching on streaming services is at an all-time high. We’re hardly moving into an era where people only watch 20 second videos in their Facebook feeds. Yes, the marketplace is shifting, but not in ways you might assume. Younger viewers will watch more video than their older counterparts on mobile devices, but 32% of the time, viewers still watch live TV – more than any other category and a full 10 points head of viewing on smartphones. Here are the takeaway points for smart marketers: never assume any media is dead until you test it and invest seriously in attracting new customers. You would be shocked the number of patients we still generate every year on radio and broadcast television. Never assume that you are your customer. You must really understand your target market and just because you don’t listen to the radio or watch Good Morning America doesn’t meant they don’t. Finally, pay attention to trends and be on the leading edge but not the bleeding edge. Sure, we’ve made a lot of money on Facebook, Instagram and Google. But, we’ve paid close attention to where the best segments of our market spend their money and how. Many of them are still in lifestyle magazines, on the radio and Pandora or watching shows that you assumed no on was watching. Know your audience and know their media. It takes decades for media to die. Television is changing but slowly enough that you should be able to successfully ride the wave for a long time.